http://www.minifauna.com has copyright to the above picture. It was Sunday afternoon, and because it was summer we were inside trying desperately to stay within the orbit of our home made water cooler. Our Indian friends had advised during the blistering heat of pre-monsoon all windows and doors should be shut tight daytime, and opened wide at night. That is except for one window where water trickled down a dried Cuss-Cuss grass screen through which a powerful fan sucked moisture laden air. There was a damp humid atmosphere throughout the house in stark contrast to the outside dry which sucked sweat from your body before it could form. Now and then we’d take a look at our overhead tank gauge to see we weren’t using too much water. City water was piped in twice a day for an hour to ensure the dam supplying city needs was not exhausted before annual monsoon rains arrived in July. Occasionally Kamala our house help would burst in through the back door to check on the stove where she was cooking an evening meal, and then rush back to her apartment behind our house to spend time with relatives who showed up every weekend for family get together. Her apartment was always bursting at the seams with a shifting population of relatives and friends additional to her own family. At this time of year the back of our property was littered with charpoy’s evenings as residents sought a cool place to sleep. There was a constant buzz of conversation as those resting on their charpoy’s shouted comments to each other in the darkness. India seldom sleeps! But this afternoon noise levels emanating from the back of our house increased to a point where they exceeded the clatter of our water cooler fan. This was not the sound of families having a rollicking good time. The noise had an urgent ring to it, and clash of metal pots crashing against each other alerted us it was time to brave the elements and take a look outside. The sight we saw increased our feelings of apprehension. Gathered in a wide circle around Kamala’s apartment were the customary Sunday visitors all shouting and gesticulating wildly. A crowd was growing by the minute as compound residents rushed in to participate in the tamasha. They’d appropriated the Mali who ventured uncertainly in and out of Kamala’s apartment poking among household effects with a long stick. The Mali was obviously frightened, but had to respond to shouted instructions as he was of a lower caste. We had frequent visits from these unwelcome visitors at this time of year. Heat bought them out in droves and of great variety. Cobras were most prevalent and were revered in villages as a personification of their god. You had to be careful walking around evenings as small vipers continued to warm themselves on sealed pathways and roads and they looked like broken twigs in the dark. Eventually our Mali managed to dislodge the cobra with his stick and it slid majestically outside the door pausing with hood extended to survey the retreating circle of onlookers. “Kill it!” some of the members of the retreating crowd shouted at Mali. He stood uncertainly with stick in hand, his legs trembling as the cobra turned to look at him. Caste or no caste he was having nothing to do with that suggestion. He was facing his god and knew the consequences of such terrible disrespect. Mali threw the stick down and ran. But one of the onlookers had no belief in this god. Leaping forward he picked up the long stick, and as the cobra retreated finished it off with a mighty whack. The crowd backed further away as this brave soul extended the stick and picked up the lifeless snake holding it high for all to see. Hindus made Namaste, Catholics crossed themselves, and the crowd quickly evaporated. 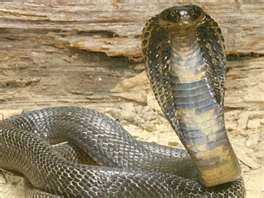 Mali was almost convulsing with fear for it was commonly believed in villages each cobra had a mate and a dieing snake would leave a photograph image of its tormenter in its eyes for that mate to memorize and search out the tormenter for revenge. Mali knew he’d disturbed the cobra from its resting place in the apartment but he’d only done this under urging to satisfy those more important than he, and had apologized to his god while performing his duty. But had the cobra placed a photo image of him on its eye, and would the mate seek him, or one of his relatives for revenge? He was sorely distressed. Of course we tried to reassure Mali that village tales were merely superstitions and there was no scientific proof a dying cobra made photo images as it died. We also assured him that no mate would be looking for either he or his family as a result of this unfortunate incident. And he’d not been the one to kill the snake either. Mali remained unconvinced. On Monday evening on my return from work I met a wide eyed Kamala anxious to tell her follow up story to the previous Sunday exciting events. Another cobra had appeared at their door in the heat of Monday sun. From that time on her apartment door was kept locked and the family sweltered in the heat inside during the night rather than join the charpoy club. The Mali nodded his head wisely. Foreigners just didn’t understand and were to be pitied for their ignorance. The appearance of this new cobra was conclusive evidence to him village tales were not superstitions at all. They were wisdom gleaned from thousands of years of experience in timeless India. I’ll have another follow up snake story for you this weekend. You can’t move away from snakes in Asia but by keeping alert you can avoid them. Snake charmers defang them and put on their shows with them all around India.